I was at the Houses of Parliament last week. In the House of Lords, to be exact. No, I haven’t yet received a peerage for services to the wine industry: I was honoured to be invited as a guest of Lord Saatchi (Maurice, the ad guy with the cool big specs, not his brother) to launch his Medical Innovation Bill, which is currently, and unusually, making its passage through the Lords and the Commons simultaneously. 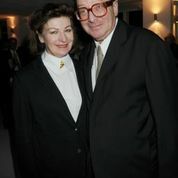 Lord Saatchi and his wife Josephine, who died in 2011. Instead of a big press conference, Saatchi and his team decided to hold an intimate event for 20 selected bloggers in one of the committee rooms of this ancient, beautiful and imposing rabbit warren of a building. We were asked because Lord Saatchi wants to spread the message far and wide about how important the Medical Innovation Bill is. So why is he so passionate about it? Well, two years ago, his wife Josephine died from ovarian cancer. Overwhelmed by grief, and shocked by how little progress had been made in the effective treatment of ‘rare’ cancers in the past 40 years, he was moved to act. His research showed that many doctors are held back from doing everything they possibly can to help – from trying new combinations or doses of drugs, new treatments, innovative surgery, or simply doing nothing (because they know the standard ‘treatment pathway’ would not work in a particular case) – because of fear. Fear of litigation, and feel of ridicule by their colleagues. It’s crazy, isn’t it? So he has worked with parliamentary colleagues and the medical profession to draft the Medical Innovation Bill. The aim of the Bill is to ultimately save lives by encouraging doctors to innovate and find new ways of treating disease – not just cancer, but all diseases and conditions. Most of us in the room had first or second hand experiences of cancer or MS. We were all moved hearing Lord Saatchi talk about his and Josephine’s experiences: his story of the barbaric, medieval, degrading treatment Josephine had had to endure before she died was devastating, and resonated strongly. I understood a little of what he was talking about: I nearly died from a common cold after my first chemo because it poisons you and wipes out your immune system, had black and blue arms that were worse than a heroin addict’s some weeks from all the needles and canulas, and after the surgery my remaining breast tissue and skin was nuked by radiotherapy. As Saatchi said, hair loss is sort of the good news. But my story was different: I knew from the outset that despite the advanced stage of the cancer, my prospects were excellent. I was ‘lucky’ enough to have had one of the ‘Big Four’ cancers where survival rates are high and treatment is evolving rapidly with successful outcomes. I also had a caring, inspired team that wasn’t afraid to innovate, putting me on a drugs trial and taking a new post-chemo surgical approach that meant I avoided a full mastectomy. Most people with cancer – and it will touch all of us at some point in our lives, either directly or through someone we love – are not so fortunate. There is a lot of talk about breakthroughs in cancer treatment, and other diseases. Breast cancer and leukemia, for instance, are no longer a death sentence. But in most cancers, too little progress has been made in recent decades, and the status quo simply isn’t working. For many cancers, there are simply no treatments other than surgery: no effective chemotherapy, no drugs, nothing. For others, there have been no advances for 30 or 40 years. Sadly, there is a commercial imperative at work here: if there’s no money to be made from a treatment, drugs companies won’t invest millions of pounds and many years in the research and development required to bring a new drug to market. We also heard from Prof. Andy Hall, a researcher specialising in blood cancers, who explained how innovation has worked in the past in finding new treatments for cancers, and why, in our increasingly litigious society, innovation is getting harder. Finally, we listened to the almost unbearable story of Debbie Binner, whose teenage daughter Chloe died of a rare cancer in February this year. There was a drug that would have treated her rare sarcoma, which ‘only’ 35 young teenagers a year have in the UK, but it had been licensed as an (ineffective) treatment for lung cancer, not her condition, and proved impossible to get hold of until it was simply too late. Can you imagine how hard Debbie fought for her daughter’s team to prescribe the drug, take a risk, do things differently? It might have saved her life. Most of us in the room were parents and you could almost feel the collective, heartbreaking thought: how do you cope, when a child dies? How do you go on? But she has, and in Chloe’s memory she is supporting Lord Saatchi in his fight to give doctors, patients and judges greater clarity as to what is careful and sensible innovation (and also, of course, what is negligent and dangerous clinical practice). Saatchi believes the Bill will allow good doctors who have the best interests of patients at heart to deviate from standard procedures and innovate safety and within the protection of the law, with patients’ consent. Although consensus from the patient’s multidisciplinary team will be an absolute requirement in advance of any innovative approach being taken, it’s true that often, innovation comes from the brilliant idea of one clinician. The doctor at Barts, for example, Geoffrey Keynes, who refused to do what surgeons across the US and UK were doing with breast cancer – the Halsted method, whereby women automatically faced a double mastectomy and the removal of all tissue from the shoulder, to the chest wall and ribs – and instead removed only the tumour and followed it with radiotherapy. He was ridiculed, and his ‘lumpectomy’ was used as a term of derision. Today, it’s standard procedure. Penicillin is another example: it came straight from the lab to save soldiers fighting the desert campaign of WWII, with no clear evidence base of years of trials. It was a new treatment, and it saved men who would previously have died from their infections. That’s innovation. Today, they’d probably be sued. If you think it’s as important as I do, please write to your MP and encourage them to vote for the Medical Innovation Bill. The louder people shout, the harder it will be for the Government to brush the Bill aside. You can also follow @SaatchiBill and #SaatchiBill on Twitter to keep up to date with the Bill’s progress. This is not a party political issue: it doesn’t matter whether you usually vote red, blue, yellow, or green. It’s going to be a long haul, and I will probably be banging on about this again. Let’s hope Lord Saatchi’s right, as he told us last week: ‘The Bill will not cure cancer – no Act of Parliament can do that – but it will encourage the man or woman who will cure cancer’.